Yes, another blackberry recipe, though I think this is one of the last for the season. I also had the opportunity to use one of my other seasonal favorites, heirloom tomatoes. This salad is so simple it almost seems silly to post, but it was really tasty. In a blender or processor puree 1/2 cup blackberries, onions, vinegar and sugar. Use half the dressing on the bottom of the platter. 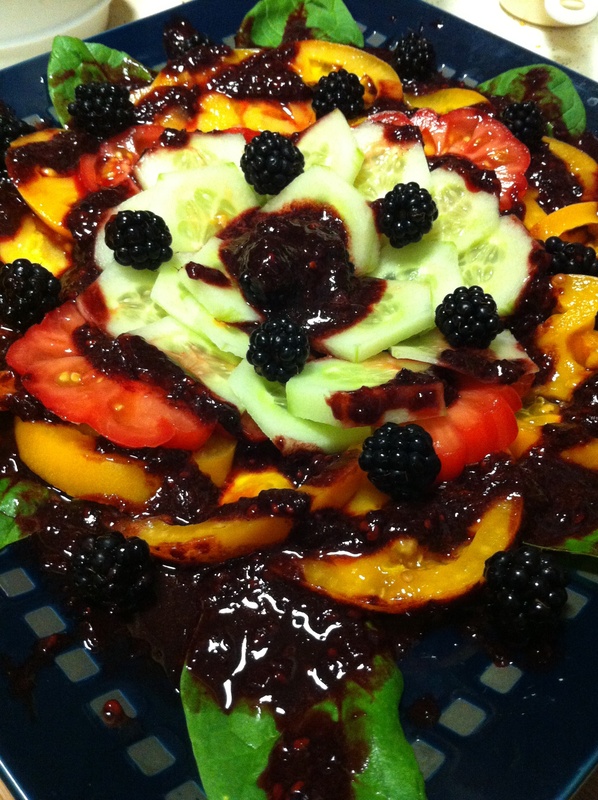 Arrange the tomatoes, cucumbers, spinach and remaining blackberries.Drizzle the rest of the dressing on top. Enjoy! Gallery | This entry was posted in dressings/sauces, Salad. Bookmark the permalink.